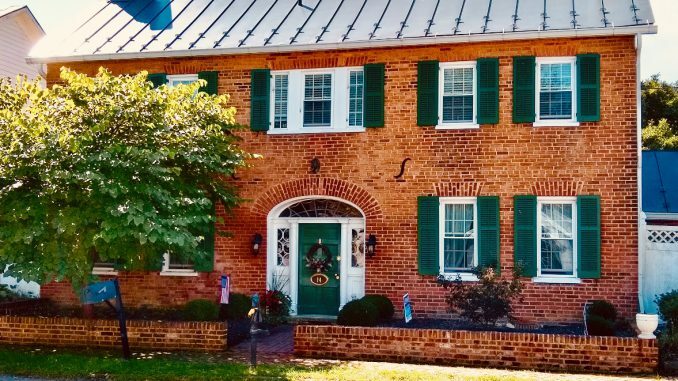 Sunday, Oct. 14, 2018 @ 2:00 p.m.
On Sunday, October 14, 2018, the Lovettsville Historical Society will present a discussion of Willard Hall, the intriguing brick building on Pennsylvania Avenue, which is one of the oldest houses in Lovettsville, and perhaps the most architecturally sophisticated. Willard Hall has always been somewhat of a mystery. Why is such a stately building located on what was known as the “back street,” where it stands out at so architecturally distinctive? Is it because it was actually built before the rest of the surrounding buildings? Was it originally set back from the colonial road which became Lovettsville’s Main Street or “front street,” today known as Broad Way? Could Willard Hall have been built before the American Revolution, as some people have thought? These questions will be explored by Cookie Anagnoson, the present owner of Willard Hall, who has been researching the history of her home. Mike Zapf of the Lovettsville Historical Society will supplement Ms. Anagnoson’s presentation, with remarks about Dr. James Willard, the building’s namesake who purchased it in 1868. Dr. James Willard was an Army surgeon during the Civil War who served with the 13th Maryland Infantry Regiment (USA), also known as the Potomac Home Brigade, and was in charge of the Union Army’s general field hospital at Sandy Hook, MD for a period of time. He lived at Willard Hall until his death in 1906, and served northern Loudoun County as a physician. Zapf has been studying Dr. Willard’s journals which he kept during the Civil War, and which are now in the possession of the Lovettsville Historical Society. In his journals, Dr. Willard discussed not only military affairs, but a broad range of historical, religious, and social questions. The lecture will be held at St. James United Church of Christ, 10 East Broad Way, Lovettsville, VA 20180. The program will be followed, as is customary, by questions and discussion. Admission is free, but donations and are welcome to defray expenses of the program and to support the activities of the Lovettsville Historical Society.